“We plan to apply anti-PD-L1 ‘IMC-001’ antibody for IND by the end of the year and enter Phase 1 clinical trial by 2018 as the fastest pipeline in Korea. Though we are a latecomer, anti-PD-L1 antibodies cannot be ignored. 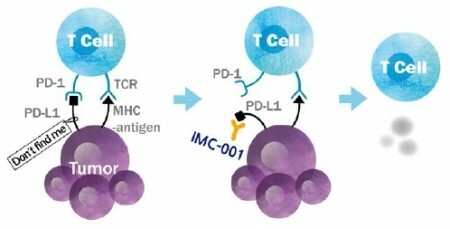 Immune checkpoint inhibitors such as PD-1/L1 antibodies are expected to play a principal role in accordance with the recent rise of demand for anticancer immunotherapeutics for combinational therapy. Thus, we plan to develop IMC-001 using a best-in-class strategy,” explained Cheong Kwang Ho, the CEO of ImmuneOncia. ImmuneOncia is marking its presence in the industry with its anti-PD-1/L1 type anticancer immunotherapy drug as the first ever candidate of its type to enter clinical trials in Korea. A recent publication in Nature’s BioPharma Dealmakers introduced ImmuneOncia in its sponsor content. ImmuneOncia has been in the spotlight ever since the announcement of its establishment. ImmuneOncia was formed as a joint venture company between Yuhan Corporation, a pharmaceutical company in Korea, and Sorrento Therapeutics, a US company specializing in antibody development. Yuhan Corporation invested a total of 10 million USD in ImmuneOncia. Moreover, Yuhan carries 51% of the shares while Sorrento maintains 49%. Though ImmuneOncia only recently celebrated its first anniversary, it already boasts a pipeline almost in clinical phase as it spent 2 years in drug development prior to official establishment. CEO Cheong states, “In order to reinforce Yuhan’s research capacity, we opted for joint research development using an open innovation strategy with Sorrento Therapeutics and its specialized antibody development platform.” Adding on, Cheong said, “Initial pipelines are provided by Sorrento’s antibody drug candidates and ImmuneOncia leads the pre-clinical and clinical development of these candidates.” ImmuneOncia seeks to increase its research capacity by using Sorrento’s drug candidate portfolio and development technology. ImmuneOncia focuses on cancer immunotherapeutics with two main pipelines: anti-PD-L1 antibody for future combinational therapy, and anti-CD47 antibody that is just entering clinical development worldwide. In the case of the first drug candidate IMC-001, Sorrento maintains rights in USA, Europe, and Japan, while ImmuneOncia has exclusive rights for all other regions. However, ImmuneOncia has global rights for the two other currently developing cancer immunotherapy drugs. One may ask, why does ImmuneOncia use cancer immunotherapeutics as novel drug targets? Recently, the development cancer immunotherapy has caused a significant shift in the cancer therapy paradigm. While previous cancer drugs specifically targeted cancer cells, cancer immunotherapy drugs activates the patient’s own immune system to remove tumors. Immune checkpoint inhibitors target immune checkpoints in the tumor microenvironment that inhibit immune cell activity. Opdivo, Keytruda, Tecentriq and other immunotherapy drugs in the market are antibodies that inhibit PD-1 and PD-L1 interactions. Normally, T cells attack cancer cells. However, If cancer cells expresses the immune checkpoint molecule PD-L1, it can bind to PD-1 on T cells to prevent PD-1/PD-L1 interaction. Therefore, T cells are ‘tricked’ and thus cannot attack T cells. Immune checkpoint Inhibitors can overcome this inhibition and allow immune cells to recognize cancer cells for anticancer activity. Cancer immunotherapy drugs can be administered for a greater variety of cancer types and to a wider range of age groups than existing cancer drugs. The drug lasts longer and exhibits less side effects due to lower resistance, which accounts for the popularity of immune checkpoint inhibitors in the market. An example is BMS’s Opdivo, which, after its release in 2014, achieved blockbuster drug status within just two years. It is expected that by 2020, the global market value for cancer immunotherapy drugs will be approximately $40 billion USD. Despite the large market potential, the response rate of patients to cancer immunotherapy drugs is merely 20%. To overcome this limitation, researchers worldwide are attempting combinational therapy with other immune checkpoint inhibitors. One problem, however, is that current immunotherapy drugs on the market are very expensive. Generally, the cost for 1 year of treatment is around $100,000 USD. Although similar drugs are already approved and on the market, ImmuneOncia is developing anti-PD-L1 antibodies due to the potential of combinational therapy. IMC-001 is a fully human anti-PD-L1 antibody with ADCC functionality. Along with inhibition of immune checkpoint molecules, IMC-001 allows innate immune cells to eliminate cancer cells via phagocytic activity. In comparison with candidates in the global market, IMC-001 has structural similarity with Merck-Pfizer’s avelumab. Cheong states, “We plan to apply for clinical approval by the end of this year to progress to clinical trials by next year… Though we have not confirmed the efficacy on various cancer types, we are keeping in mind of the high number of stomach cancer patients in Korea.” Thus, ImmuneOncia plans to use the global network to pursue a best-in-class strategy. Commercialization and marketing in Korea will be handled by Yuhan Corporation, while marketing in other regions, still in consideration, may be managed by global partners. ImmuneOncia anticipates the pipeline ‘IMC-002’ to have global potential. IMC-001 is a fully human antibody that targets CD47, a high-interest target in the global market. 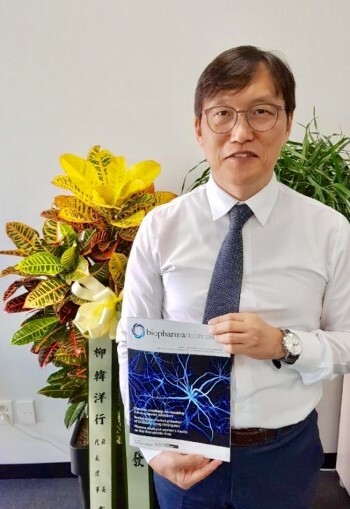 Cheong states, “Global pharmaceuticals that have PD-1 and/or PD-L1 antibodies do not have this pipeline, and so IMC-002, despite its early stage in development, already received great interest from multiple companies… our goal is to use a first-in-class strategy to finish the preclinical stage quickly before the end of next year for expedited entry into clinical phase.” To accomplish this, they are collaborating with large Korean companies to quickly develop cell lines and produce antibodies. What is the reason that global pharmaceuticals focus on targeting CD47? Current PD-1/L1 targeting antibodies generally target factors expressed on exhausted T cells. Exhausted T cells in cancer tissues are constantly exposed to tumor antigens and subsequently lose T cell activity. Cancer immunotherapy drugs either remove the brake that prevents T cell function via PD-1/PD-L1 or activate T cells from exhaustion. The primary immune checkpoint molecules are VISTA, LAG3, TIM3 etc., and immune maintenance factors are OX40, CD40, GITR, etc.. However, anti-CD47 antibodies approaches at a different angle. Rather than targeting T cells, CD47 targets affect inactivated macrophages. Specifically, anti-CD47 drugs inhibits the ‘don’t eat me’ signal presented to macrophages by cancer cells. The key interaction occurs between CD47 on tumor cells and SIRP-a receptor on macrophages. Anti-CD47 antibodies inhibit the signal transduction pathway and activate macrophages to eliminate cancer cells. Patients with poor prognostics generally have greater expression of CD47. Interestingly, recent research claims that macrophages play a key regulatory role in cancer biology. Moreover, activation of phagocytic activity is not the sole factor, as it was reported that inhibition of CD47 allows dendritic cells to increase T cell’s anticancer activity. According to recent research, combinational therapy using anti-PD-L1 antibody and anti-CD47 antibody shows a positive synergistic effect. This opens the doors for future clinical trials of combinational therapy. What about global competition? The companies Forty Seven, Celgen, Trillium, and Alexo Therapeutics have CD47-SIRPa targeting pipelines currently in Phase 1 clinical trials. Moreover, Novimmune, Tioma, Surface Oncology, and OSE Immunotherapeutics have candidates in preclinical stage. Clinical trials for combinational therapy are in progress. Forty Seven’s combinational therapy of rituximab, which targets CD20 on B cells, and anti-EGFR antibody cetuximab, primarily used in colorectal cancer patients, is currently undergoing clinical trials. Meanwhile, Alexo Therapeutics’ combinational therapy of atezolizumab and trastuzumab is in Phase 1. ImmuneOncia is also developing another immune checkpoint inhibitor IMC-003 (classified) monoclonal antibody. Moreover, it is developing the pipelines IMC-2101 and IMC-2102, which are chimeric bispecific antibodies that target PD-L1 and another synergistic anticancer target. The bispecific antibodies are currently in early platform development stage.